Alexandre Masino paints now, not only in the present tense, but in the immense tense of renewed painting. When it is handled well, encaustic yields color that is richer and a surface that is more tangible than conventional oil or acrylic. Masino handles the medium masterfully, wrestling from it every nuance of shape, shadow and hue. 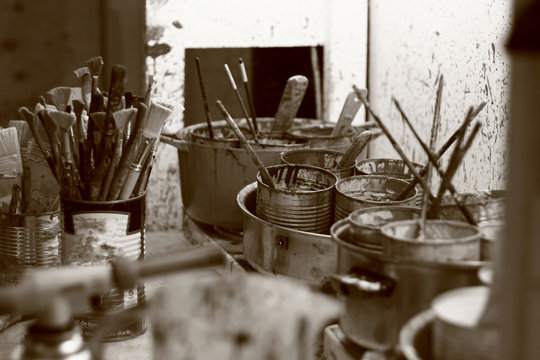 Such control does not easily flow from the brush, and certainly not when it is employed in service to representation, for unlike conventional paint that is brushed on wet and needs time to dry, encaustic is applied when it is molten, a state that exists for a second or two before it hardens. There is something extremely sensual and tactile in the combination of wax and panel, and togther with Masino's choice of subject matter, his latest work usurp a particular place on the contemporary art scene.